Teacher Appreciation Week, which is held during the first full week in May, is a week designed to honor teachers. It is also a convenient time to take a moment to thank teachers for the hard work that they do. While a simple thank you will go a long way, accompanying it with a gift doesn’t hurt. This year, think beyond the apples and homemade cookies and replace it with one of these ideas. Teachers spend a lot of their own money on classroom supplies. Even though the school year is almost over, you can help get through to the last day of school and start to stock them up for next year by giving a classroom supply basket. 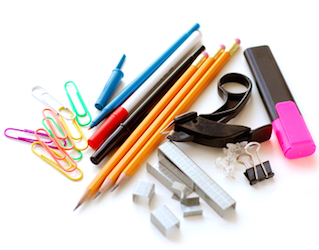 Pencils, crayons, glue, and markers are items teachers can always use more of, but you don’t have to stick with the obvious. Encourage your favorite teacher to make a special wish list earlier in the year and purchase something off of the list wish list as a Teacher Appreciation Week gift. If you know there’s something bigger the teacher wants, such as a set of books for the classroom or a large rug for circle time, get together with a group of parents to purchase it. Even though the school has its own library, many teachers also keep a classroom library stocked with books for students to read. These books are often purchased by the individual teacher and the expense can add up. Instead of giving the teacher a card, consider giving a book instead. Let your child help you pick the book since she will know what types of books the kids in the class like to read. For preschool, kindergarten, and first grade, popular picture books are always a good choice. However, you don’t have to get a picture book or even a piece of fiction. You can also pick up a non-fiction text about one of your child’s favorite topics. If you want to make the book a little more memorable, include your child’s name or a short note inside the cover of the book so the teacher will always remember who it came from. Having a lot of resources on hand can make a teacher’s job much easier. Educational subscription services help provide teachers with those resources. Magazines, such as Highlights, Time for Kids or one of Scholastic’s range of magazine options are a good choice. Don’t forget about digital subscriptions either. Resources such as BrainPop can help a teacher save time by providing interactive lessons. Gift cards also help offset the amount of money teachers spend in the classroom. Consider a gift card to a teacher supply store, Dollar Tree, or even Amazon to help teachers get supplies they need. Bookstore gift cards can help teachers build up their classroom libraries. If you know a teacher who regularly uses apps in the classroom and like to try out new technology, iTunes or Google Play gift cards are another option to help them build up their library of resources. Of course, the gift you give doesn’t have to help the teacher in the classroom. You may want to give a gift card for a local coffee shop or movie theater. You can also help them relax with a gift card to a local spa. Fast food gift cards are handy for teachers who spend a lot of time at school and need to pick up dinner on the way home. If you don’t want to spend a lot money, there is one handmade gift that is always accepted by teachers. A simple handwritten note thanking a teacher for their hard work and explaining the impact they have had can go a long way. Teachers don’t always have a place to store all of the mugs and trinkets they receive, nor do they want a lot of homemade treats, but most have a special place to keep the notes from their students. Nothing makes a teacher feel better than to know they’re making a difference. Are you a teacher? 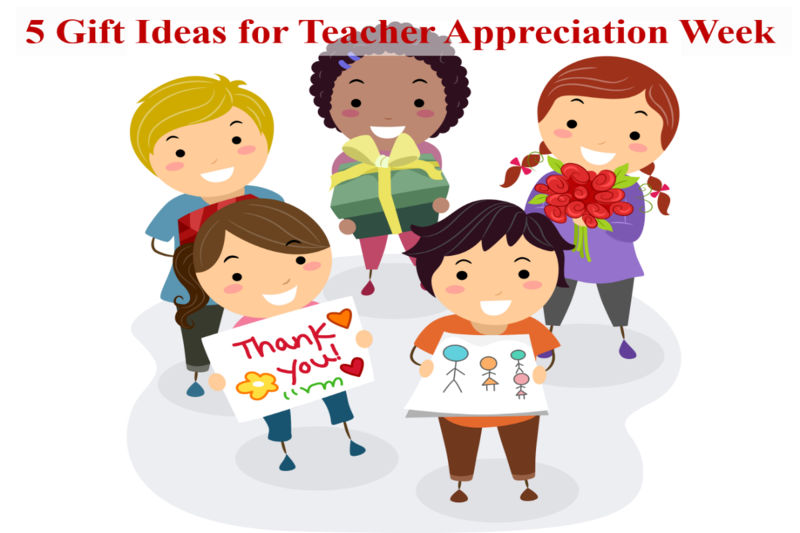 What types of gifts do you appreciate most during Teacher Appreciation Week? A little gift of encouragement goes a long way. Words matter. I’ve kept every kind note ever given to me by a student or parent. They inspire me in the “dry” days. I love little notes form students, parents, or my administrators that lets me know that my hard work is appreciated. Kind words mean everything. However, I get excited about everything I get form students! I am an Iranian teacher . here the students gather their money and buy a gold coin for their teacher. but lovely notes stick in mind better. I like to communicate with the parents about their children`s progress/ feedback every two weeks. I work at a Title 1 school where most of my students are economically disadvantaged. But that being said, I still feel like a super star on every holiday, including my birthday and teacher’s appreciation. My students shower me with gifts from homemade foods, cards, and gifts, to stuffed animals right from their toy chests. I know that any and everything that they give me comes from a place of love, respect, and adoration. I am so blessed to be allowed to teach these amazing, selfless individuals. I would love a PRO Subscription to Help Teaching. As a busy middle school teacher, I rely on activities and ideas from the internet to help me find new ways to engage my students. I teach in a Title I school that is 100% free/reduced lunch; and, the majority of my students are way below grade level. I find it more and more challenging each year to find/or develop lessons that keep them engaged. I must find lessons that will reach all types of learners such as audio, visual, and kinesthetic learners. So, having a PRO Subscription would benefit me greatly! Thank you. I love gifts that are hand made from the heart. I just like knowing that you have been taught of whether through words of encouragement, a flower they pick on the way to class or a note. Anything Is loved. I love to receive gift cards and personal notes. You are right…a thank you note goes a long way…but a gift certificate to WAWA or (dreaming) a spa or restaurant would be lovely as well. Truthfully, though, our parents give us breakfast one morning and a lovely luncheon. That is more than enough. I appreciate hand-written notes from students or their parents. In my give years teaching, I have received five hand-written notes that I treasure every one. Secondarily, I enjoy supplies for the classroom. I teach English at an Alternative Education High School in Flint, MI. We are 100% free/reduced lunch and all of my students are highly at-risk and way below grade level in reading and writing. The best gift of appreciation I could receive would be ideas and strategies that work! A gift card would be nice, too! I love getting a note from students showing their appreciation and how I have had an influence on their lives. Since I teach at the high school level, gifts are few and far between. Even high school teachers liked to be appreciated! Because of this I make sure my student council members do something special for the teachers throughout the year. Gift cards with a handwritten note are my favorite. It’s useful to have some financial help with purchasing resources for the classroom, and I like that gift cards give me the flexibility in what to buy since my needs tend to change throughout the year. Handwritten notes and cards are amazing personal touches though, and always bring a smile to my face! Hand written thank you notes from students and parents are the best. I save them forever! Handmade notes, cards, and pictures are very meaningful. Especially appreciated is when a student contacts you years later to let you know that you had a profound positive impact upon his or her life. I was recently contacted by a few students from a class I had 33 years ago. I was only there one year. (The school closed, I lost my job, and moved on.) The sentiments expressed by those students (one finally tracked me down and contacted me on Facebook after years of fruitless efforts) didn’t just make my day; they validated my entire career! I also work at a title one school and the best feeling is when the kids make things for me on their own. Buying something is not always the best to make you feel like you matter, but having the kids show you they care and need you is the best present that could be given. Anything that isn’t chocolates( healthy choices like a bowl of fruit are preferred ) candles ( at least I can wash with soap ) or a photo frame. I cherish the handmade notes and pictures because there was thought and time put in to thank me for doing a job I love. I post them in my room by my desk to remind me of why I became a teacher in the first place when days get challenging. Those notes are words and pictures of encouragement. I would love Pro-Subscription to give me ideas of teaching and help me to save time for prepare teaching. I love very innovative,reusable and advanced subject softwares,esp those one can even use on a cellphone,like teacherpro.My school and learners can benefit a lot since I will be able to share the idea of benefits that comes with the use of Technology in a maths class to both my school and others. Actually all I want is some nice items to give to my students for a job well done. I appreciate almost anything that can come in handy in the classroom from brooms, organizational tools, sharpies,and expo-markers. . I keep all the notes and print off emails from parents. it is so nice to be appreciated. Our jobs can be tough some times. Hearing appreciative words serves as motivation to keep on doing what we think is good for all our students. Even if the tasks of molding and teaching them is “difficult” in a way, it makes us realize that what we’re doing is worthy to them. These are much better than just bringing in an apple. My favorite gifts have always been pictures or notes the students took the time to do themselves. There’s nothing more touching than knowing a student took the time to do something so personal. Since I teach LLD and ED students, I am continually searching for new ways to structure my plans in a multimodal way so that there is a maximum chance of reaching each of my students. I read as much as time allows me and regularly search the internet for information and resources. Therefore, any gift of print, kit, or digital resources is always greatly appreciated. That being said, I must say that nothing has touched my heart more in the way of appreciation as information that my past students are thriving and remember my instruction, guidance, and understanding as major reasons for their success. I really love gift cards, especially from Amazon as I purchase most items for home and the classroom. More lasting is a heartfelt card of thanks or appreciation that list how I may have influenced them in a positive way. This was my first year teaching and I didn’t not have a rug in my room. I did not want my kids sitting on the cold floor, so I purchased a small area rug. I would love to have a larger rug in my room for circle time. Gift are Welcome and well used! Notes, letters, and invitations to graduations and weddings are the gifts I treasure. Like someone else mentioned, I have a binder and box where I keep my collection for those times when I need a little a reminder that what we do matters! I may be living from paycheck to paycheck; yet, I feel like the richest person in the world. My students love to see me in the class, when ever I am on leave next day they come close to me and ask number of questions y I was on leave. This makes me feel great their concern is a great gift for me. They make hand written cards and write messages on what ever paper they find, to gift me, this a treasure for sure. I have received thank you emails months after I last had a student. The notes thank me for being nice to them and really listening. The kids tell me that I made their lives better because someone cared. Those mean more to me than any material item. I made a difference. The very best gifts I have ever received are the handmade, homemade gifts. I love cards that the students make and the gifts from them which are from the heart. When the student gives a gift from the heart it touches me to know that I have made a difference their life. Don’t get me wrong I also love the giftcards as teaching can be very expensive without the help of all the wonderful parents who help with supplies!!! I try very hard to reach each of my students and sometimes they do not understand how much I care until the following year or after they graduate. This year is the year where many of my school supplies that I bought for my students to use in my classroom have been broken, taken or left in pretty sad shape. I am not trying to give my students supplies because I am supposed to, but I give them to my students so they will have the opportunity to succeed and to do their very best. I have not given up on children because I know they are our future. I plan to continue to assist my students with the materials necessary to be successful in my class, so they might dwell on learning the concepts in algebra necessary to get where they need to be. I could use all the help I can get, so teacherpro would benefit me greatly. Handwritten notes are so valuable these days. Anything that a student writes or gives to me I keep in the scrapbook. I view it as their original and unaltered work. i Love what ever is it from true love and mostly love handmade cards with love !!! My favorite gifts are homemade gifts and cards and handwritten notes! The best gifts that I receive are the ones that my students have made. I love personalized gifts and DIY gifts from students. I keep all of the notes, cards and pictures that students give me… every one. My gift from students will be their getting A* in external exams, remembering me when they leave school and acknowledging the hard work that all the teachers do for them. My best appreciation gifts usually come to me at the end of the year through notes from students. The very best are notes from students that let me know what an impact I have made on their lives. These notes usually come from the students that I have struggled with, to whom I thought I was not getting through. These are the keepers that I pull out when I am feeling down to help me remember why I came into the classroom in the first place. My students love-the best gift ever.They express it in different ways.I like when they share their feelings,thoughts and ideas with me. My students Love-the best gift ever(when they share feelings,thoughts and ideas with me). I love when my students tell me they have learned something new and interesting. I prefer to get a gift card so I can decide what I need. I love home made stuff and to be able to be with my son watching him grow and learn is priceless. As a teacher in junior high school,I myself prefer to be equipped with more impressive educational helping aids.As most websites are inaccessible in our country and new published English books and magazines are few,this can be a good offer which works for me within area. Educational subscriptions and books are always on my list. If the student creates something by hand, it will become a treasured memento. This year’s list also includes a new rug and a few cushions for students to sit and relax while reading. I love the heartfelt notes and cards, maybe a bookmark or a hand picked flower form their garden. A big smile and friendly words and acknowledgment that you’ve really helped them is the best present ever. Its not a job you do for the accolades or even the money, but a kind word does go a very long way. This would be a wonderful thing. My favorite gifts are books and supplies for the classroom. I spend a lot of money to stock my library. It is money well spent because many of my students do not have grade books to read at home and this gives them a resource to use. My favorite gifts are those made by my students. Whether it’s a note or a hand-made card or a craft project, these are the gifts that inspire me and keep me going! They’re also nice to have to remember my students by in future years! 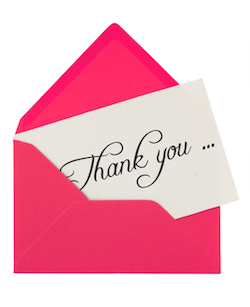 I have to agree – a simple thank you means more than a purchase gift/gift card. Homemade cards are the best. In fact, a simple hug is great, too! A note or card from a high school student is very meaningful because you know it is self initiated.. I save them all. A note from a high school student is very meaningful because it is self-initiated. I save them all. I love gifts that my students make! It’s nice to have something to remember them by! Hand sanitizer, tissue, school supplies, and office supplies are great gifts that can be shared with students. Any acknowledgment is very much appreciated. Flowers make me happy all day and classroom supplies are always needed. My favorite gifts are those from the heart or those that the student chose. I keep every kind note or “love note” as I call them. When I am having a difficult day, I read the “love notes” that I have received through the years. They help me remember my purpose. Perhaps one of the most special gifts that I’ve ever received was a note of thanks from a parent. What made it special was that she was sure to give the principal a copy of it as well. It was her way of telling the principal that I was a great teacher and had made an impact on her child. I truly love my babies! I am just as happy to receive a hand written note from them as anything; however, seeing that I do teach in a rural school district with limited supplies, I could and would greatly appreciate this gift. Of course anything a student gives is greatly appreciated! The best gift is a gift card or classroom supplies along with a handwritten note. I remember my first year teaching, the students gave me a gift card to a department store. I was able to buy a coat once it went on sale and have been wearing it ever since! I always remember each one of those students with fond memories each time I put on my coat. I also have the card where each student wrote a special note to me – that is the best gift of all!!! I like cards from my students the best and keep all of them. They are always sweet and sometimes very funny and help me remember my students years after they have moved on. A “Thank you” with meaning behind it goes a long ways….It’s even better when it comes from a student or parent. These days, it doesn’t matter if it is the families of my students, my colleagues and even my students. Just the simple and easy words of ‘thank you’ would be appreciated and isn’t said enough. Working with many disadvantaged families, they can’t afford much and I never expect receiving any gift. A simple thank you is plenty! Plus, when students hear their parent, grandparent, or other guardian say those magic words, what better way to set examples for their/my student. Doing so in front of their child might increase their awareness of how powerful those words can be let alone increasing their basic mannerisms which often times is failed to be taught in the home (sadly). I love notes and homemade gifts. I keep them, take them out when I need a boost, and read them. I also love Bath & Body “Stress Relief” (eucalyptus spearmint). I offer a squirt of the hand lotion to my students before they take an assessment. The kids love it and it makes the room smell great. I treasure the notes my students give me. I look forward every year to adding to my collection of love from my students. Working in a urban district with special needs students. Any resource we can get will be put to use. Any gift whether small or big along with a kind sincere note makes me very happy. I love to give as well as receive gifts. It acts as an encouragement and it increases love between hearts. Inspirational and informative books are worthy too! I cherish the notes from students and parents because they are straight from the heart. Making a difference is the best gift! I love when i get pictures of my students. I’ve saved them all and often revisit the pictures during the summer and reflect on the school year. “Oh, I get it now.” from a struggling student is the best gift of all. I’ll take hugs and notes, as well….. I teach at a high school where there is a mixture of poor and middle class pupils. For me the best gift to receive from my students is when they tell me that they understand the work we covered for the lesson and they look so pleased with themselves – all smiles. That encourages me as an educator. While supplies and gift cards are always greatly appreciated, my most treasured gifts are the ones that students have made or picked out for me. I have some beautiful treasures (rocks, pictures, a rubber worm, a plastic frog,…) that remind me why I teach each time I see them because I know that they were given from the heart. The gifts I like to receive are the ones from the heart. I love when children run up to me to give me a hug, when they draw cute little pictures saying “I Love Dr. Miller”, and the ones where they show how much they care that I am teaching them and they are learning. A simple handwritten note I always cherish and keep in my drawer……I teach high school students and getting a note from them means that they really love and respect me coz this age group kids are very selective when it comes to select their fav.teacher and I feel proud when I get notes from them ….